Call Me Mrs. Rapp: WIAW: Girls Dinner! Well it's safe to say that I've been pretty absent from my normal weekly posts, including What I Ate Wednesday and my Fit Fridays post. If any fellow teachers are reading this, you probably understand my lack of time has been due to all the crazy end-of-the year events and projects to finish. We're done a week from tomorrow, but I feel like there are a million things to do before then - field day, 8th grade graduation, report cards, curriculum orders, class lists...I could go on. Anyway, I thought I'd jump back on the bandwagon so here goes. 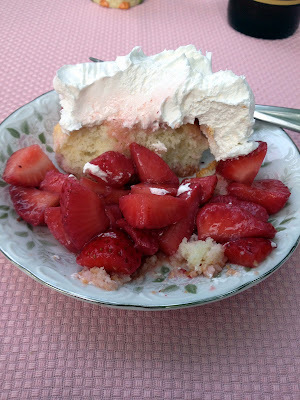 This is from yesterday (as most my WIAW posts are from my Tuesday eats). If you're looking for more good eats, head on over to Jenn's blog and see some of the others! Breakfast: I was dragging this morning. Like whoa. So, I didn't get a nice egg sandwich. Instead I grabbed a yogurt on my way out the door. It was tasty as always, but I've become quite attached to my egg sandwiches. Lunch: Thank goodness for leftovers! Lunch was a breeze to grab since I already put leftovers together from dinner last night. We had some rockin' salads, with lots of goodies. The salad included: baby spinach, romaine, tomatoes, bell peppers (red, green and yellow), avocado, cucumber, pine nuts and feta. I topped with my favorite homemade dressing (olive oil, red wine vinegar, minced garlic & dijon mustard), and it was just packed with flavor. I had some sliced strawberries on the side to satisfy my ever-present sweet tooth. Snack: Grazer alert! I had a handful of pretzels and almonds sometime after getting home from changing my blow out of a tire. I will post a picture soon, but right now it's not on my computer, and I'm too tired to find it! Dinner: One of my favorite nights of the month! My Indy girlfriends (and sorority sisters) get together once a month for a "girls dinner." We rotate hosting duties each month, and a different girl brings sides, dessert, appetizers and/or wine/beer. We talk, eat, laugh and have a blast together. It's one of the highlights of my month! Love, love these girls! Ally hosted tonight's dinner, and it was a fabulous spread. You can see all I noshed on, plus her amazing decorations and hosting skills at work. So grateful for my wonderful friends! plus salad with homemade greek yogurt dressing...and the CUTEST owl salt and pepper shakers! Ally is an amazing hostess - she pays such attention to the details! The strawberry shortcake looks amazing! How fun! The food looks delicious! It was sooo good! Ally is a great cook!! Awww, thank you for the kind words. :) It was so much fun to have everyone over! I'm looking forward to getting together again on Saturday... then our vacation in just a few WEEKS! Vacation in less than a month! Woo hoo!! !